The 1982 Commonwealth Games were held in Brisbane, Queensland, Australia from 30 September to 9 October 1982. The Opening Ceremony was held at the QEII Stadium (named for Elizabeth II), in the Brisbane suburb of Nathan. The QEII Stadium was also the venue which was used for the athletics and archery competitions during the Games. Other events were held at the purpose-built Sleeman Sports Complex in Chandler. The Chairman of the 1982 Commonwealth Games was Sir Edward Williams. The 1982 Commonwealth Games Logo was designed by Paulo Ferreira, who was the winner of a nationwide competition held in 1978. The symbol is derived from the form of a bounding kangaroo. The three bands, forming stylized A's (for Australia), are in colours which are common to flags of many Commonwealth countries. 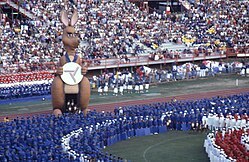 Matilda the kangaroo mascot for the 1982 Commonwealth Games was represented by a cartoon kangaroo, and a gigantic 13-metre (42 feet 8 inches) high mechanical "winking" kangaroo, who travelled around the stadium and winked at the crowd. The games were officially opened by The Duke of Edinburgh and closed by The Queen. Bidding for the XII Commonwealth Games was held in Montreal, Canada at the 1976 Summer Olympics. Lagos, Brisbane, Kuala Lumpur and Birmingham were the bidding cities. On 14 July 1976 it was announced that Brisbane had won the rights to stage the Games after the other candidate cities withdrew bids earlier that year. Brisbane was awarded by default of being the only Candidate City left at the bid election after Birmingham reversed its decision to submit an application. Nigeria's boycott of the Montreal Summer Olympics made Lagos' bid lobbying impractical. The Montreal Summer Olympics were plagued with cost overruns and bidding on a sports festival anywhere in the world was not good politically. 46 Commonwealth nations and territories took part in the 1982 Commonwealth Games. A total of 1,583 athletes and 571 officials participated in the event. The Griffith University campus was used as an athletes village. ^ Note: The Falkland Islands debut at the games was partially poignant coming less than four months after the Falklands War. Sports contested during the 1982 Commonwealth Games included athletics, archery, badminton, lawn bowls, boxing, cycling, shooting, swimming, diving, weightlifting and wrestling. Table tennis and Australian football were demonstration sports. Athletes Village - Griffith University and Mount Gravatt College of Advanced Education. The ceremony at the QEII Stadium was held on a fine but extremely windy day. The wind was so strong that skydivers who were going to descend into the stadium were cancelled. Instead they made an entrance at the closing ceremony. The first event of the Games was 100 kilometres (62 mi) Road Trial in cycling. England won the Gold Medal in the event, and Australia won the Silver Medal—coming second to England by only six seconds. Other sports which were contested on the first day of competition included swimming and diving, weightlifting, shooting and bowls. Sports contested included swimming, diving, weightlifting, shooting, cycling, bowls and archery. The day was marred by both Australia and Canada being disqualified in the 4 × 100 metres relay in swimming, both problems occurring during change-overs. The medals awarded for this race went to England, Scotland and New Zealand. Sports contested included swimming, diving, cycling, athletics, archery, hammer throwing and shooting. The day was marred when Canada was again disqualified, this time in the 4 × 200 metres freestyle relay. Canada protested against the winners, Australia, as well as against their own disqualification. Elizabeth II closed the Games during a colourful ceremony, which included parachute jumpers (who had originally been also intended as part of the Opening Ceremony display) jumping and landing in a special target area within the stadium and red, white and blue balloons. Matilda the Kangaroo also winked at the Queen. Following the closing of the Games, the Queen and Duke left the stand to be driven from the stadium. However, nobody wanted the Games to end and the Australian team formed a 'guard of honour' and ran beside and behind the car in which Queen Elizabeth and Prince Philip were travelling, as it circled the stadium several times before finally leaving. Team members from other countries also joined in running after the royal car. This is the full table of the medal count of the 1982 Commonwealth Games. These rankings sort by the number of gold medals earned by a country. The number of silvers is taken into consideration next and then the number of bronze. If, after the above, countries are still tied, equal ranking is given and they are listed alphabetically. This follows the system used by the IOC, IAAF and BBC. The Brisbane Commonwealth Games were also noted by large-scale protests by the Aboriginal rights movement in Australia, which brought to the centre of international media attention the lack of land rights, poor living condition and suppression of personal and political rights in Queensland in particular, and in Australia as a whole. The protests, which were followed by large-scale arrests, are a significant event in the history of the Australian Aboriginal movement. The Matilda mascot from the opening ceremony was relocated to Wet'n'Wild Water World, a water park in the Gold Coast hinterland. Unfortunately, in 2007, Matilda lay out the back of Wet'n'Wild in pieces, until 2011, when the winking icon found a new home at the back of the Kybong Matilda fuel station (now a Puma Energy station), near Gympie, and has been thrilling visitors and locals with her impressive stature. In 2009 as part of the Q150 celebrations, the 1982 Commonwealth Games were announced as one of the Q150 Icons of Queensland for its role as a "Defining Moment". ^ "Queensland Sport and Athletic Centre". Austadiums.com. Retrieved 28 August 2016. ^ "Commemorating the life of Sir Edward Williams". 2004. Supreme Court of Queensland Library. Archived from the original on 20 July 2008. Retrieved 7 December 2015. ^ a b Cole, John R. (1984). Shaping a city. Albion, Queensland: William Brooks Queensland. pp. 350–353. ISBN 0-85568-619-7. ^ a b Phil Lutton. "Could the Gold Coast ever beat Brisbane's Games?". Brisbane Times. Fairfax Media. Retrieved 14 November 2011. ^ a b McBride, Frank; et al. (2009). Brisbane 150 Stories. Brisbane City Council Publication. pp. 274–275. ISBN 978-1-876091-60-6. ^ "Provincial Councils". The Official Website of the Government of Sri Lanka. 3 September 2010. Archived from the original on 7 July 2009. ^ The XII Commonwealth Games, Brisbane , Queensland, Australia, September 30 - October 9, 1982 : The Official History. Brisbane: The XIIth Commonwealth Games Australia Foundation. 1983. ISBN 0959220712. ^ "Could the Gold Coast ever beat Brisbane's Games?". Brisbanetimes.com.au. 11 November 2011. Retrieved 28 August 2016. ^ "Commonwealth Games Medallists - Boxing". Gbrathletics.com. Retrieved 28 August 2016. ^ Foley, Gary. "A Short History of the Australian Indigenous Resistance 1950 - 1990". The Koori History Website. Retrieved 12 October 2015. ^ Peters, Daniel (4 August 2015). "'Winking Matilda' from 1982 Commonwealth Games sits outside a service station | Daily Mail Online". Dailymail.co.uk. Retrieved 28 August 2016.